Combine the garlic cloves, parsley, and olive oil in a small food processor until the garlic breaks down into small pieces. If you’re using sliced mozzarella, stack the cheese slices and cut into 1 inch squares. Heat the butter over medium heat in a small saucepan. When the butter melts, add the chopped garlic to the butter along with a pinch of salt and allow the mixture to cook for 2 minutes, stirring as necessary so the garlic does not brown. Remove from heat. Position a rack in the center of the oven and preheat the oven to 375ºF. Using a sharp serrated knife, make 1 inch diagonal cuts across the loaf of bread making sure you don’t cut the bread all the way through. Use a spoon to drizzle the garlic butter into the the cuts of the bread. Stack 3-4 cheese squares and place them in the cuts. Place the garlic bread on a sheet of foil and fold up the sides. Use a second piece to cover the top (we’ll be removing this later). Allow the bread to bake for 10 minutes. 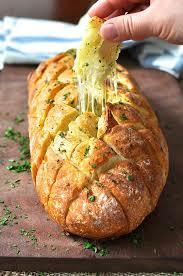 Remove the top piece of foil and allow the bread to bake for another 10 minutes or until the cheese melts completely. Serve warm.